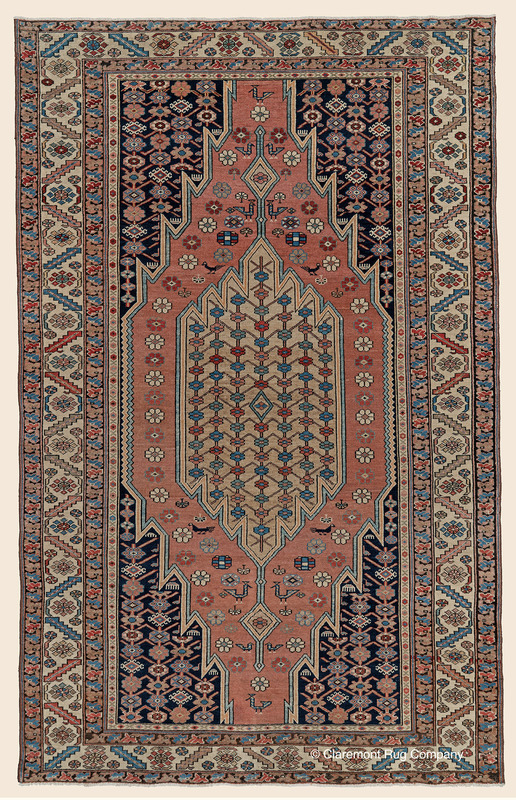 Search Our Inventory / All Rugs / 4&apos; 3" x 6&apos; 8"
4&apos; 3" x 6&apos; 8"
(High-Decorative) This is among oldest and well preserved of Mazlagan rugs we have seen, predating the early to mid-20th-century jewel-toned rugs that are more commonly found. A much more finessed work than these later pieces, this desert tone geometric carpet is striking. Its distinctively elongated medallion's terra-cotta ground introduces naive blossoms in a single chain that appear in the inner medallion forming a latticework and in the corner spandrels. Perching bird pairs and a sprinkling of weaver's combs are meant for the surprise of the viewer. This rug's distinctive, aged tonalities are perfect for use as an accent in a contemporary or sun-drenched environment.